The feature rich ACTAtek unit combines the security of the latest optical fingerprint recognition technologies with the power of a linux based platform. The pairing of the two, industry proven technologies, allows for a robust and stable solution for any access control need. 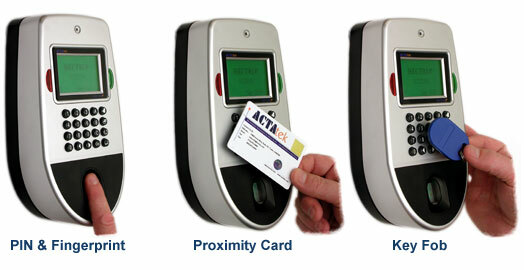 Unlike similar products, the ACTAtek is both scalable and secure. The ACTAtek is capable of handling up to 7000 users and can be networked with other units throughout your campus and across town; yet it is cost effective enough to use for controlled access through a single door. Most biometric systems require cumbersome administration practices in order to fully utilize the security advantages of their platforms. The ACTAtek unit is designed to take the hassle out of integration and configuration. With built in web server, standard network connectivity and primary/secondary topography, the ACTAtek makes the task of integration simple. Virtually all configuration tasks are performed via a secure connection from any standard web browser. Access policies, user management and reporting can be performed easily from an administrator’s desk. The Primary/Secondary mode allows a user to enroll at a single unit with the information automatically propagated to other units in the network group. Paired with sophisticated authentication capabilities, the ACTAtek makes the cost of ownership very favorable compared to other access control solutions.